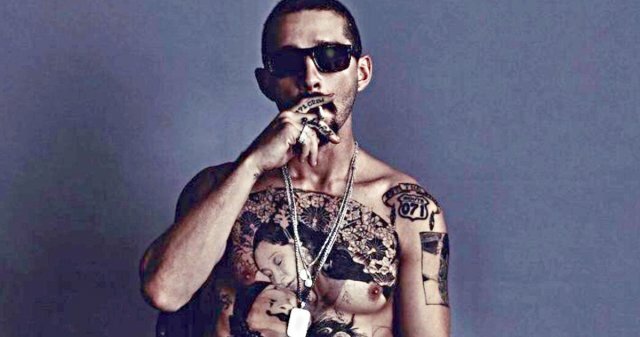 I don't know if Shia LaBeouf ever tried out to play Joker in Suicide Squad, but based on this first look at David Ayer's Tax Collector he might have made a suitable option over Jared Leto. The controversial actor is covered in ink as part of Ayer's upcoming crime thriller which was just announced a couple of months ago. The two previously teamed up on the WWII tank film, Fury, in which LaBeouf's most distinctive physical trait was his mustache. Clearly that won't be the case this time. There's a lot going on here: the too-small shorts, the stogie, the sunglasses, and Lord knows what's in that cup. I'm guessing it's not Starbucks? And then, of course, there are the tats. You can't really miss that giant "Creeper" label all over his stomach, and I'm guessing that's going to be a good descriptor for his character. We don't know much about the film's story, other than it will be a return to the gritty street flicks from Ayer's past like Training Day, Harsh Times, and Street Kings. George Lopez, Lana Parrilla, and Chelsea Rendon co-star. LaBeouf's been on a roll lately with American Honey and Borg vs. McEnroe. Hopefully this keeps his streak going, and I wouldn't mind seeing Ayer get talked about in a positive way again. He's a good director, and Suicide Squad and Bright get hammered a bit more than they deserve, but they don't play to his strengths and The Tax Collector looks as if it might.